We invite you to join us on the journey! 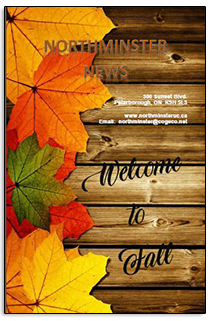 On behalf of the congregation at Northminster United Church we are delighted to welcome Rev. Kevin Derry as our new Minister effective July 1st 2019. At a congregational Meeting on March 31st the selection committee reported that Rev. Derry was being recommended to the congregation. By an overwhelming majority vote Rev. Derry was to be invited as our Minister. Rev. Derry has been at Trinity United Church in Peterborough since 2005, prior to that he served in Trenton and at two charges in Alberta. We want to thank the selection Committee for their work and Rev. Lynda Hodgins for her service to our congregation. Linda will be with us until the end of June. We are looking forward to having Kevin with us and to work with him to grow Northminster to greater heights. Where are we and where are we going? ... Allow me to introduce myself. I am Rev Lynda Hodgins and have been at Northminster since October 2018 in the role of Retired Supply Minister. I have had the opportuntiy to walk through a time of transtion with Northminster United Church. Prior to my coming to Northminster the congregation had worked with and through a Joint Needs Assessment process. This process helped the congregation discern hopes and dreams for a future ministry. Through this process of meeting, conversation, prayer and discerment the congregation was able to articulate strenghts and needs as well as what skills they were looking for in a new minister. These hope and needs were gathered in the form of a Joint Needs Report. 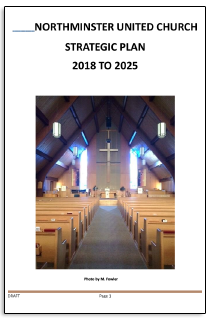 Following this period of Needs assessment, the Northminster Search Committee was established and this committee has worked during this transition time to find the 'new minster' who will journey with the congregation into the future. Such a period of transition in a church can be difficult as folks wonder what the future will bring. There is often a sense of wanting to 'get on with things'. However, just as it is not always wise to rebound too quickly from one personal relationship to a new one, so it can be of benefit for a church to move slowly and mindfully through the 'inbetween' times; that time between saying goodbye to an outgoing minster and welcoming a new one. This transition time can be a time to look at customs and traditions and decide what it is important to keep and what it is time to let go of. It is the time to ask: what is God calling us to do and to be as we move into this new ministry, how is God calling us to love our neighbours? It have been my great delight to walk with the folks of Northminster this past many months as we have travelled this path and it is with enthusiasm and excitement we face the future. In the not too distance future it is hoped our congregation will call a new minister and we look forward to our ongoing ministry in this community. If you are already part of our church family we are happy to be travelling with you. If you are looking to become part of a church family, come check us out. All are welcomed in this place! We seek to be a welcoming, open and genuinely caring community of faith, and we hope that you will experience our warmth and vitality and want to be a part of who we are and who we will become. We offer many programs for people of all ages. There is opportunity to meet new people, to find support and healing for your stresses, to grow in your faith in God, to share your gifts for the good of the community, and to serve those who are in need. Northminster's music program is a blend of traditional and contemporary. It includes a talented Choir which leads us in hymns and delights us with anthems. Our Sunday gatherings are relaxed and inviting, blending the relevant spiritual issues of the day rooted in the stories of Scripture. We are committed to being inclusive and valuing other faith traditions. Our theology is progressive while respecting tradition. There is not much dogma or doctrine but an opportunity to question as we journey to discover what the Spirit has for us both individually and as a community. Our weekly service is at 10am and there is always an opportunity to enjoy a cup of coffee and a time of fellowship and fun. At Northminster, outreach is an important part of the ministry and there are opportunities to be involved with both local and global outreach. Our building is utilized by a number of notable organizations that are vital to this community. Come and be a part of this joyful, loving and nuturing Christian community. We invite you to ask questions, to introduce yourself to our staff and congregation, and to write your name in our guest book so that we know you are among us. Subscribe to our newsletter and stay updated on the latest news and events! We, the people of Northminster United Church, seek to be a caring, accessible and inclusive Christian community; a safe place, where people can come and experience the grace of God and the warmth of fellowship, while having opportunities for local and global outreach. Northminster United Church is fully accessible.